Demonstrate the stratification of different sized grains. With this teacher-developed activity, students quickly and easily demonstrate layer separation in the formation of sandstone using a mixture of sugar and colored fine sand. The mixture is placed in a squeeze bottle then poured into a tank. As the mixture heaps together, the sugar and sand separate and form a striped pattern easy to discern. 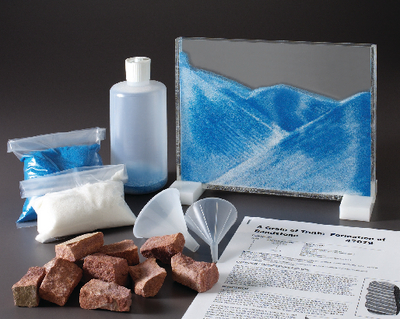 It includes blue sand, sugar, squeeze bottle, 97/8"W x 8"H x 3/4"D acrylic tank, ten sandstone samples, and instructions.